Did you add AMS (ammonium sulfate) to the tank water and agitate it BEFORE adding the glyphosate? Ammonium sulfate is a surfactant, whose purpose is to improve retention on the leaf surface and increase movement of the herbicide from the leaf surface into the leaf. AMS also softens “hard” water, helping to nullify the impact of naturally-occurring magnesium and calcium. 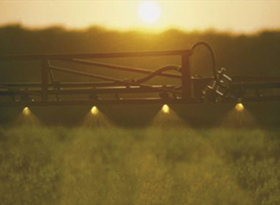 WIthout AMS, the minerals in water will compromise the effectiveness of glyphosate.Adding AMS helps the translocation of glyphosate to the annual ryegrass. What time of day was the glyphosate sprayed on the annual ryegrass cover crop? Proper translocation of glyphosate into the plant tissue depends on the air temperature, the weather and what time of day you apply it. For more specific information on this particular aspect, click here to take you to the annual ryegrass website. This entry was posted in Dan's Digs, General Information and tagged Annual ryegrass, burndown of cover crops, Dan Towery, glyphosate, management of annual ryegrass. Bookmark the permalink.